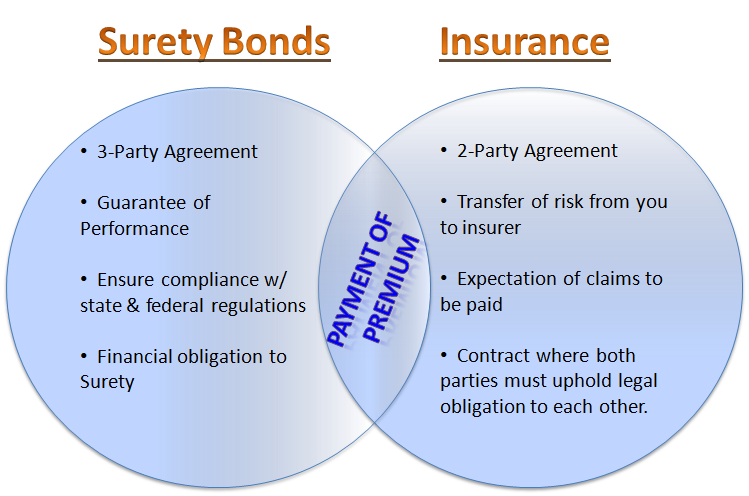 Surety Bonds vs Insurance - The Difference. Many consumers assume that business insurance and surety bonds are the same, but this is a huge misconception. If you decide to get business insurance coverage, which is a great idea, it will not suffice for specific components of your business operation. However, it will protect some of your most valuable assets and prevent financial loss, in the event of an accident. Below, you will discover several differences between business insurance and surety bonds. Both, the surety bond and insurance require a contractual agreement. However, the surety bond involves three parties, including the obligee, principal and surety, which will be defined a little more in depth a little later on. Now, the insurance agreement will only involve two parties, the client and the insurer. While this is only a minor difference, it just shows you that the insurance policy is designed to protect you from financial loss. As mentioned above, the surety bond contract involves three parties. The obligee is the project owner or the client of the contractor. The principal is the contractor and the surety is the Surety Company or underwriter. The surety bond protects the project owner from financial loss, but it is also very beneficial for the contractor. Going more in depth, the insurance policy offers a full range of coverage for specific types of accidents. It will reimburse the business owner for losses caused by accidents, such as fire, theft, embezzlement, injuries to third parties, including employees and natural disasters. This coverage is a necessity for all business owners and many provinces and territories in Canada require businesses that hire employees to obtain commercial liability insurance. Surety bonds protect the investments of the project owner. If the general contractor fails to abide by the terms written in the contractual agreement, the project owner has the right to create a surety dispute with the surety company. The surety company will in turn investigate to see if the claim is valid or fraudulent. If the outcome is found to be in favor of the obligee the surety company will payout a predetermined amount to the project owner. The contractor will then be required to reimburse the surety company for the total amount of the payout. Both, the insurance and surety bond require the contractor or business owner to pay a premium. In most cases, the contractor will be required to pay an annual premium, but this will be determined at the time the contract is activated. Most insurers allow their customers to pay premiums monthly, quarterly, bi-annually or annually. It doesn’t really matter as long as the payments are received by the due date. The premium paid by the business owner to the insurer is designed to cover any potential losses. Whereas, the surety bond premium paid to the surety company are just a guarantee that the contractual agreement will be fulfilled. If the contractor or business owner does not make the scheduled payment, the contract will be terminated. It is also important to note that insurers expect accidents to occur, so the premiums are adjusted to cover losses. The surety company does not expect any losses, since the principal is classified as a “qualified contractor”, so the premiums are never adjusted. If the surety company is forced to payout a lump sum to a project owner, the contractor will be responsible for the payout. When the insurer settles a claim, the business owner will not be required to reimburse the insurer. The surety bond basically protects the project owner, in the event of a breach of contract. The surety company puts the contractor through a rigorous prequalification process to ensure the contractor is fully capable of fulfilling the contract. Once the contractor is bonded, it makes him/her look more appealing to a project owner, giving them more opportunities to earn winning bids.